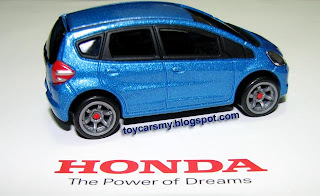 Tomica just launched Honda Fit 2008 to it regular line-up. The car is definitely a nice looking model, but it should equip with better wheels to bring up its uniqueness. After the upgrade, it immediate looked sporty and gorgeous. 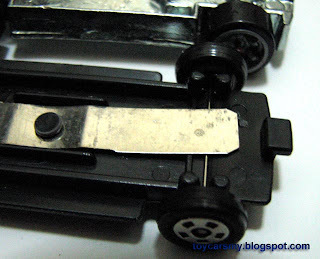 To “upgrade” the wheels, you need minimum a drill, super glue and cutter. 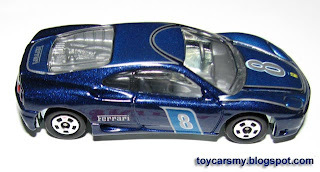 In this upgrade, I will replace the Tomica trade mark wheels with Ferrari 360 Modena. Hot Wheels is selected due to its scale is close to Tomica. Any wheels bigger than Hot Wheels may not fit into Tomica. 1st, drill open the plug beneath the cars. 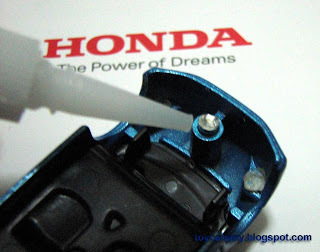 Open the bottom carefully, avoids damage the wheels rod. 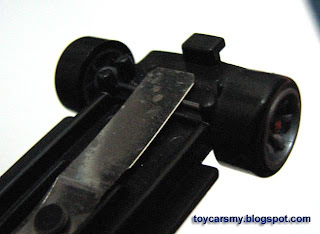 Hot Wheels uses 3 metal grips to secure the wheels rod. 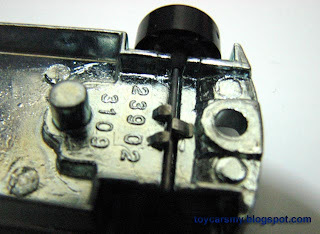 Where Tomica with a piece of thin steel to hold the rods and also function as suspension. 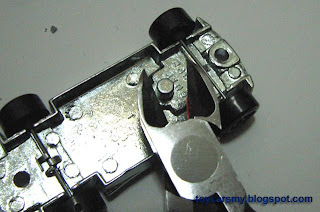 Use cutter to remove the metal grips. Replace the wheels with Modena. 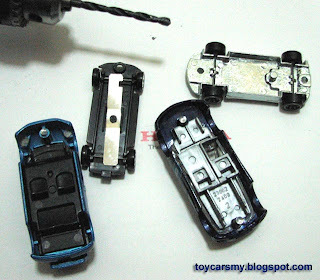 Assemble back the wheels-base, apply slight super glue on the body, put back the base and let dry. 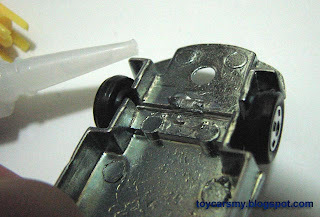 For Modena, apply super glue at the center to secure the wheels rods. Repeat the steps to re-assemble back the body. The Modena looks more decent with Tomica wheels. Not bad either. Nice going. Looks simple enough. I already have a drill lying about somewhere. 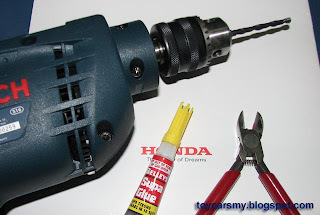 Could you advise what size is the drill bit that you used? I don't remember. As long as it fit to the plug and don't dageme the base will do the job. Hic....I'm so pity for Modena... 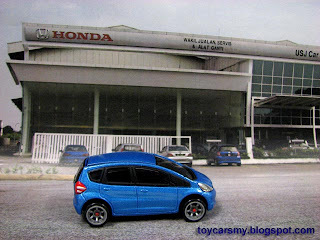 But the Tomica look more prettier than before... Good Job! Looking forward, please share with us. 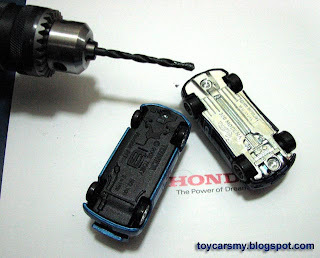 Thanks for sharing your way of changing the wheels from HW to Tomica. I also have the same idea if I want to do that. But I am now thinking of adding a light to my TL Initial-D AE86. Have not do it yet. Hope you can share some of your idea. I was thinking use transparent pastic and make it into triangle shape & paint it before gule it on the car.